Toastmasters sure knows how to hook ya. In the past year or so, a few friends began talking about attending about Toastmasters meetings in their respective cities. Since my calendar is a clean slate lately, I’ve been trying to fill my time with new things. Sure, why not? There are multiple Toastmasters groups in Fort Collins — I chose Noonshiners, which meets downtown. I loved my first meeting — it was highly organized and the people were friendly. Toastmasters has a structured system for who makes a speech, who evaluates a speech, who times a speech, etc. 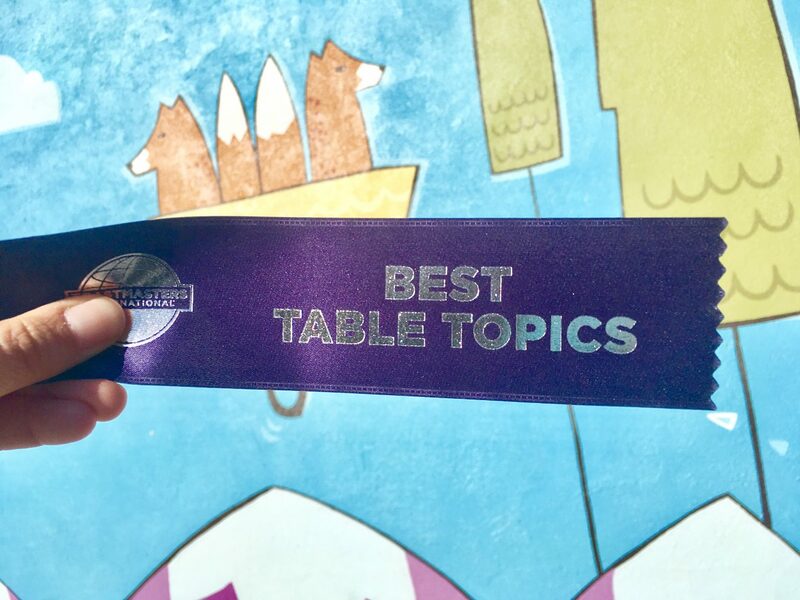 One of the regular agenda items is “Table Topics,” where any attendee can make a 1-2 minute speech off the cuff based on a question posed in the meeting. This is when I managed to snag a blue ribbon at my debut, baybeeee. Did the group cast their votes specifically to encourage the newbie? Oh sure, probably. Will I visit Noonshiners again? Yes, yes I will.